If a picture says a thousand words, what do your pictures say about your products? If your answer is “not much,” don’t fret. Capturing great product shots for your ecommerce website is quite easy with a few low-budget product photography tips. Best of all, you can get great results using your iPhone or Android phone, and we’ll show you how. Want an easy and affordable way to upgrade your iPhone or Android photography? Get clip-on lenses here, starting at under $20. In this guide, we’ll explore the key elements of product photography and how to get professional-looking results on your own. Product photography generally includes three types of photos: Studio, Lifestyle, or Glory shots. 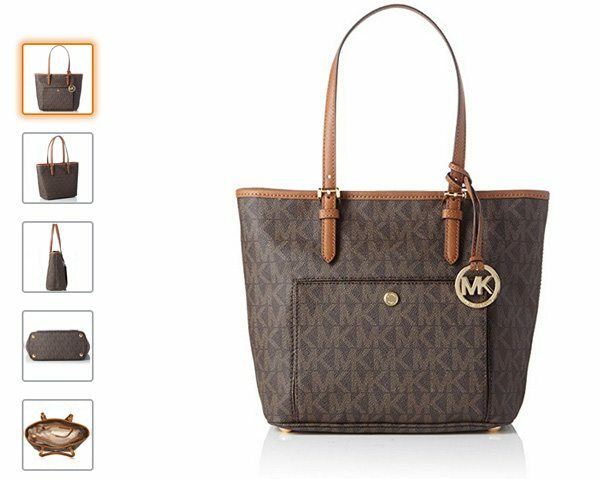 While each type of shot is useful in conveying information about a product, some shots showcase certain items better than others, especially on ecommerce websites. Let’s explore each type. Studio shots focus on the product alone. These are the most common and effective type of shot for selling products online. These shots are well-lit, taken against a plain or very simple background, show different angles, and highlight fine details. Studio shots are considered ideal because they cut clutter and keep shoppers focused on the product. Lifestyle or in-use shots show the item being worn or in use. These are useful for showing relative size or fit for products such as watches, purses, jewelry, clothing, and decorative accents. They also help shoppers visualize how they might use items like electronic accessories, cookware, desk accessories, and home decor. Think of elaborate magazine spreads and print advertisements. These stylized product pictures are called “glory shots” because they showcase your products in all their glory. This type of product photography takes lifestyle shots up a notch to showcase items in realistic settings. Glory shots require work and space to set up, but can be worthwhile since they let online shoppers see how products will fit into their lives. As you start shooting the various product shots mentioned above, you’ll find that capturing high-quality images take up a lot of storage space. It’s a good idea to back up your photos to cloud storage as you go, so you don’t run out of space during a shoot or lose your work due to a drive crash. This is the top tip from product photography pros. A wash of soft, natural light provides the best color balance for product photos and minimizes harsh shadows. You can find this perfect light outdoors on an overcast day or at mid-morning or early evening. For years, I’ve used this technique to capture product shots for my own ecommerce website with great results. If outside light isn’t accessible, you can mimic it in a number of ways. The key is to diffuse, meaning spread and soften, the light. This minimizes shadows and enhances colors in product photography. For small items, you can use a tabletop light tent, sometimes called a light box, to diffuse light. For larger items, you can simply clamp or clothespin sheets of blank white paper over light sources to diffuse light. When shooting ecommerce product pictures indoors, the most important element is the light bulb. Many household bulbs create warm white light, which casts a red-orange tint in photos, while most fluorescent lights cast a greenish tint. For indoor product photography, use inexpensive 5000K daylight/cool white bulbs to provide a wash of light that’s very close to natural light. You can find these on Amazon. Tip: If using a light tent, you’ll get the best results using identical light bulbs on both sides. Smartphone tripods make it easy to capture crisp, detailed product shots without a flash. In product photography, the flash alters colors and casts hard shadows. With a tripod you can use longer exposure times instead of a flash, which we’ll discuss in later in this guide. Another plus when using a tripod is that you can set the shutter delay so your camera takes the picture a few seconds after you touch the screen. This is ensures sharp, in-focus images every time. 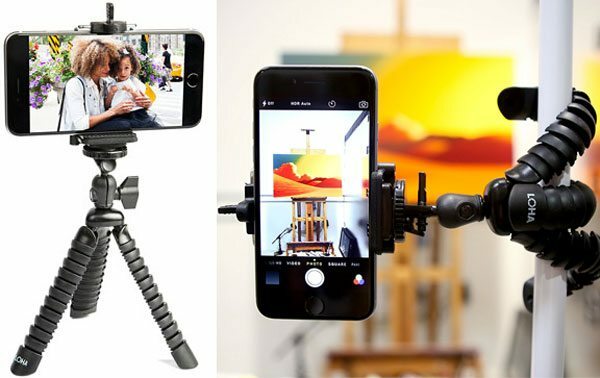 Most universal tripods like the one pictured below fit all smartphones and are quite versatile. They run from $15 to $30 on Amazon, depending on brand and attachments. As discussed in the previous section, if you can, set up your photography table outside or next to a large window to capture natural light. If you don’t have access to natural light, set up your table in a space that allows plenty of room to work. This way you can play with the placement of lights and your phone camera. 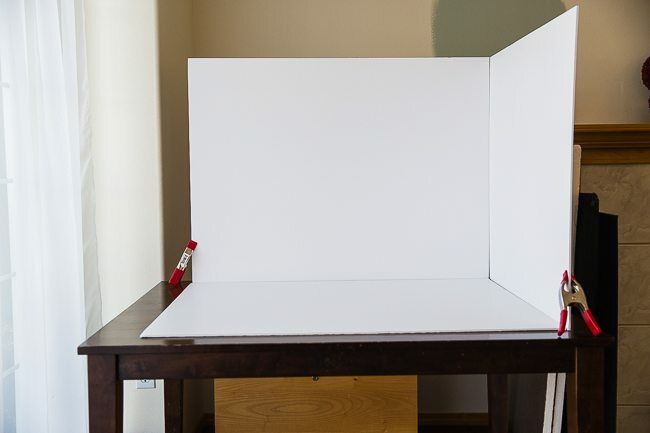 As seen in the previous section, white foamcore sheets create great background walls for your tabletop studio. You can use them alone or create what the pros call infinity curves or sweeps, like the one pictured below. 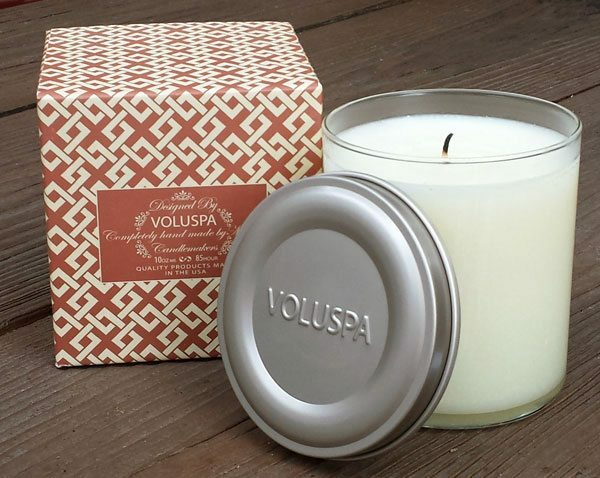 The idea is to create a smooth curve behind the product using paper, poster board, or fabric. This is an easy way to create distraction-free and shadow-free backgrounds that let your product take center stage. 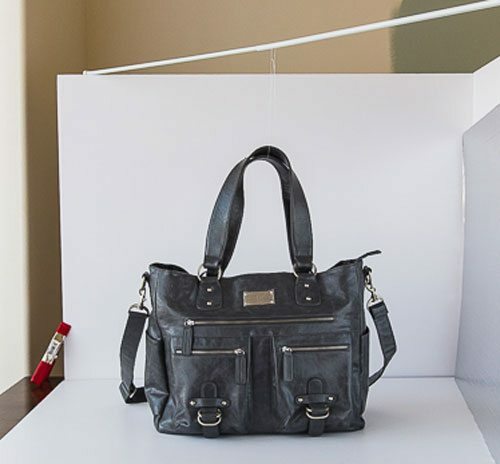 For shooting larger items, you can hang background materials from a wall or clamp them to tripod stands or a tall item, like a ladder or coat rack. Then drape the material down and over your table. Inexpensive clamp-style work lights are great for do-it-yourself photography lighting. With these, you can use anything handy as a stand. If you’re shooting often or shooting in different areas, you might find it easier to purchase tripod stand lights. With tripod lights, you can add clamp-on extension arms to hold light diffusers and adjust as needed. Product stands or risers help to lift items off the table to reduce hard shadows at the base. They’re also great for staging product assortments or group shots. Stands can be made by draping upturned items, like boxes or storage containers, in white or colored cloth, depending on the look you want. To prop or stand items upright, you can use small picture display easels. Tip: Use glue dots to keep items and stands in place. 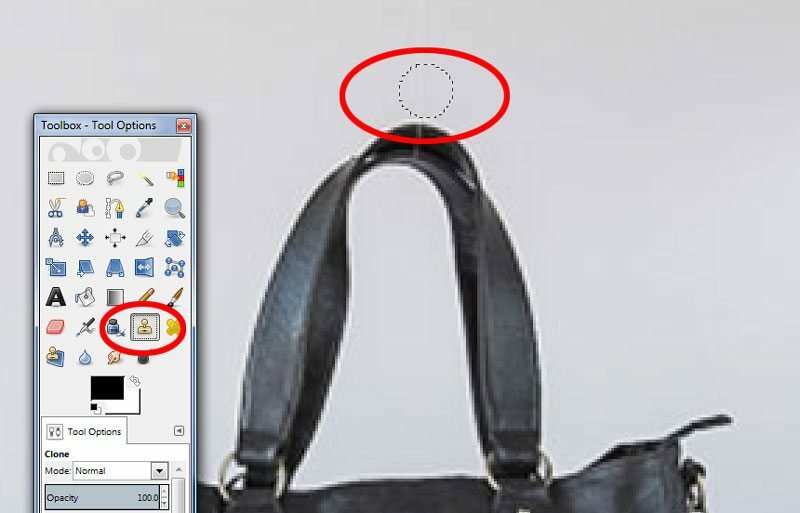 Also try fishing line attached to a rod or fixture above your set to hold things like purse handles upright, as shown in the image below. The fishing line is easily removed from the image using simple photo editing apps, which we’ll explore later in this guide. All Android and iPhone cameras have basic automatic settings you can use to capture great product images if you’ve followed our lighting tips above. If the basic settings don’t get the job done, there are other ways to make your phone’s camera work even harder for your product photography needs. We’ll explore them here. With the right light, you can rely on automatic point-and-shoot settings to capture great product images. You’ll usually find these automatic settings by tapping the settings icon found on the edge of your phone’s camera screen. Some phones feature them under a different photo options or modes icon on the screen, so be sure to explore. Detail (also called Macros) – This is useful for creating images that capture close details in focus with blurred backgrounds. They provide a professional look for your detail shots. Click here for more info on taking close-up detail shots with your phone camera. Daytime/Outdoor – These settings optimize light and white balance when shooting outdoors. Night – This creates a slower exposure to capture more light. Used with a tripod, it can help you capture good product shots indoors without using manual settings. Enhanced Color – This setting can help bump up product colors when shooting outdoors on an overcast day. Both iPhone and Android phone cameras make focusing a breeze when shooting products. There are manual focus settings you can explore, but the tap-screen auto focus options common to all phone cameras will take great product shots. You can set the focus anywhere on your product by tapping the screen to set the focal point. The result will be a crisp, in-focus image for your web store. On automatic settings, cameras take a reading of the type of light you’re shooting in and adjust settings to compensate. This is the White Balance (sometimes called Temperature) setting. For example, fluorescent light adds a greenish tint and standard light bulbs cast a red-orange tint. Automatic white balance compensates to reduce the tint. In product photography, it’s helpful to have manual control over this setting since minor adjustments can make images really pop. Plus, getting the white balance right during shooting can eliminate the need to color-correct images on your computer. That’s a real time-saver. Exposure is how long your phone camera’s lens is “open” while taking the picture. Longer exposure times allow more light to be captured by the camera. In product photography, exposure control lets you take the best image using the light you have available. So if your light is a bit low, you can set a longer exposure to capture more light and brighten the image. Longer exposures need a still camera, so you’ll definitely need to use a camera phone tripod to keep your phone still and your shot in focus. You can also set your shutter to delay — this is also found in your phone’s basic camera settings. This makes the camera take the photo a second or two after you touch the screen and ensures crisp, clear images. 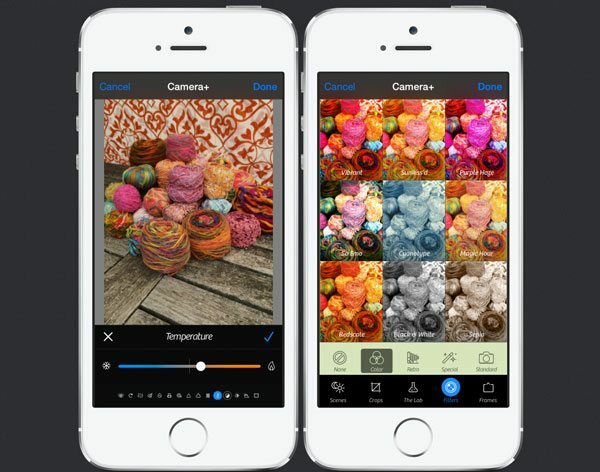 Camera+ is the top camera app for iPhone users. It has terrific auto settings and easy access to manual controls including focus, exposure, white balance, and color filters. As shown below, Camera+ makes it easy to take crisp, color-corrected product photography from the start to save time in photo editing. At $2.99, it’s well worth the price. This camera app offers simple manual control functions such as an exposure slider, plus fantastic auto settings if you’re unsure of using manual settings. 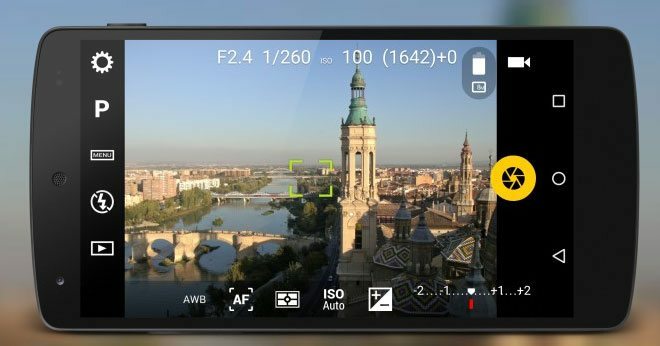 For Android camera phone users, Camera FV-5 provides everything you need to take professional looking product photography and cut photo editing time. 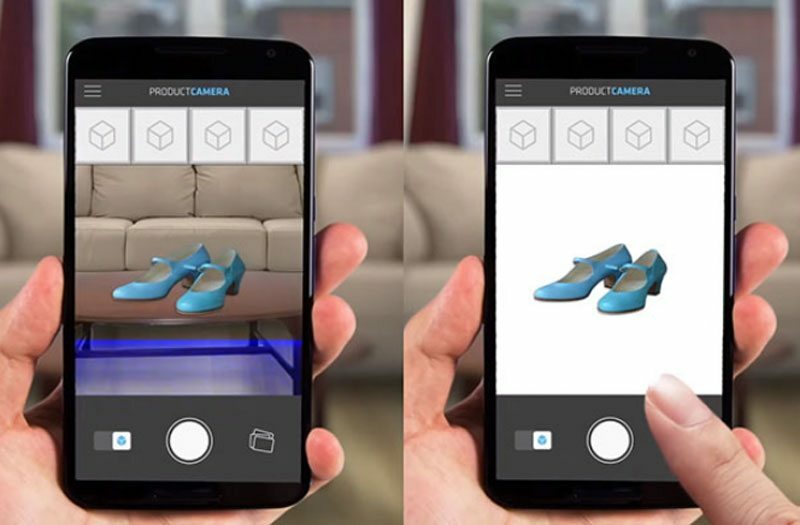 Product Camera offers an alternative to learning how to take product shots with a white background. This app removes the background for you, and you end up with your product image against a white background. Creating this effect in photo editing software takes skill and can be very time consuming. So even though you have to purchase the completed images, it can be a good deal due to the time saved. 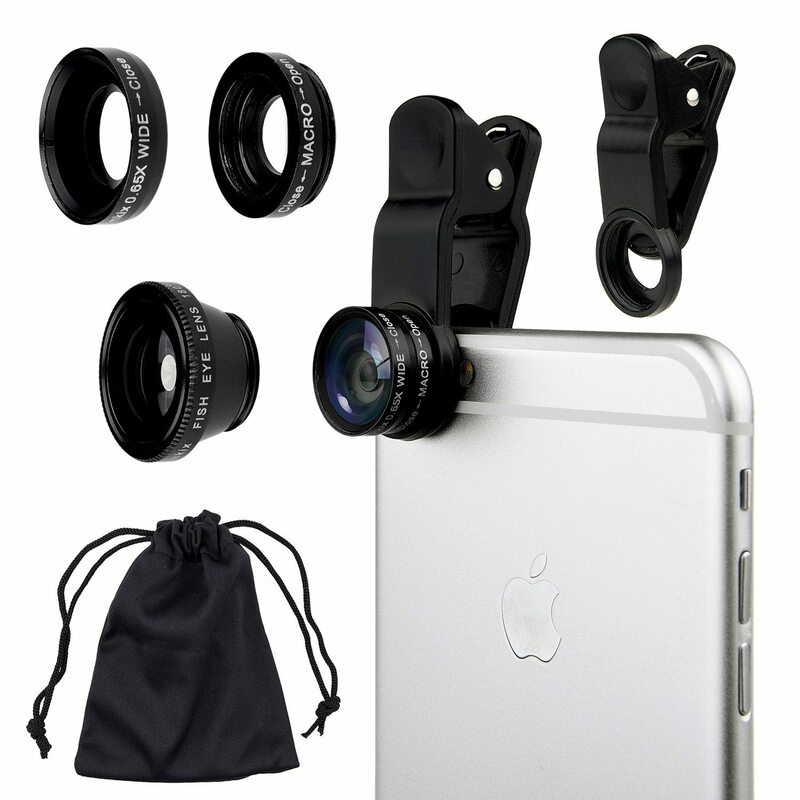 Most standard phone camera lenses are equivalent to a 30mm lens, which is what professional photographers consider a mild wide-angle lens. For the non-pros out there, this means if you take a picture with your camera very close to the product, it appears distorted. On the Left: I held my phone close to the item, about 12 inches away, and the candle shape appears distorted, like the side is angled out from the bottom. It’s subtle, but noticeable, and therefore not an accurate representation of the item. In the Center: I moved the camera back and shot from about 18 inches away. The candle isn’t distorted and I still have a crisp image that allows me to crop in for detail, as shown in the third image. On the Right: To create a close-up shot of the item’s name and logo, I simply used the image in the center and cropped close to the logo using photo editing software. We’ll discuss how to do this in the following section. If you’re taking a lot of close-up product shots, a clip-on macro lens will allow you to capture details clearly without distorting the image. This can save you time in editing, too, since you won’t need to crop images to create close-up shots. You can find universal clip-on lenses that work on both Android and iPhones on Amazon, starting under $20. If your shots are well-lit, you’ll have little editing to do aside from cropping and saving your product photos for website use. Most phones have built-in tools for cropping and saving pictures, but better photo editing programs and apps offer more options. Plus, they let you save images optimized for website use. This means they’ll load more quickly and look better on most website browsers. Gimp is free open source photo editing software that gives you virtually all of the color, cropping, and file saving power of Photoshop Elements (see below), but without the cost. It’s a very close second to Elements in some ways, but in others it’s right on par. For cropping, fine-tuning colors, and saving your ecommerce product pictures, Gimp will cover your every need — for Free! 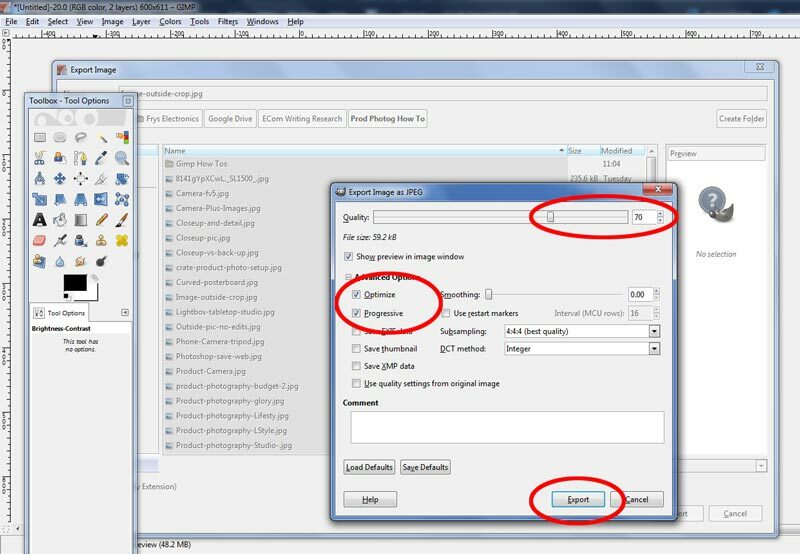 See how we used Gimp to crop and save pictures for this guide in the section below. I’ve edited hundreds of so-so product images in this program with great success. It has a powerful suite of photo editing tools and saves images perfectly for web display. Plus it offers automated sizing tools for bulk image processing which is handy if you have many images to resize. 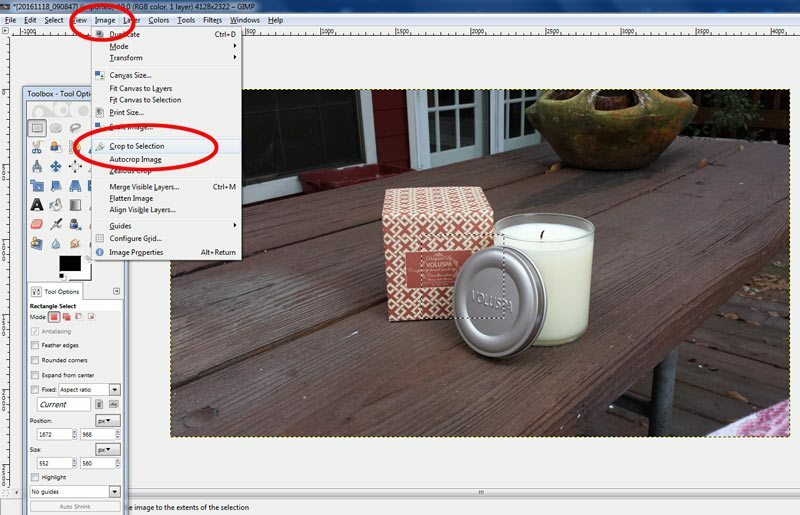 Anything you need to do with ecommerce product photos can be done in Photoshop Elements, but it does come at a price. This phone and tablet photo editing app offers much of the needed photo editing power of the computer version for free. Plus, you can edit without downloading photos to your computer. What a deal! This simple, no-frills phone and tablet photo editing app has some very nice auto filters which can easily fix color imbalances and lighting issues on your product shots. Once you’ve chosen your photo editing software, it’s time to get to work cropping and resizing images for your website. Here, the most important thing to remember is size matters! Image size and resolution, file size, and file type are the three main factors to consider when cropping and resizing images for web use. Here’s how I used Gimp to control all three factors when cropping and saving product pictures for this guide. Your ecommerce store system (Shopify, BigCommerce, WordPress Ecommerce Plugin, Etsy, etc.) will state the preferred images sizes in their setup or store management tutorials. And they will list image sizes in pixels (px) — this is a screen measurement. All photo editing apps will let you change measurements to pixels when saving images if not already preset. As a rule, product images are best saved at about 600-800 px wide. Smaller images may not show the details you wish, and larger will appear overly large on screen. But always refer to your ecommerce store for their optimal image sizes. For website use, the size of your photo’s digital file depends mainly on three factors: image color range (more colorful = higher file size), overall image size, and level of resolution detail or quality. Controlling the image’s color range is tough. It’s a photo, after all. But you can affect the final file size by controlling the image size (as we did above by scaling the image in Gimp) and the image quality. In most photo editing programs, you can adjust quality in the final save steps, which I’ll show you in #3, below. Tip: You may see a Resolution setting when you create or save images. Typical screen resolution is 72px per inch. So 72px resolution is what you should select for online images when you see that as an option. The most common, and best, file type for website photo images is a .jpg. A good rule of thumb is to save a .jpg at medium quality for good detail at a file size that won’t slow your product pages down. Tip: Most photo editing programs and apps let you save other types of files, including .gif or .png files, but these create large files for photo images. For photos, stick with .jpg files to keep your file sizes manageable. 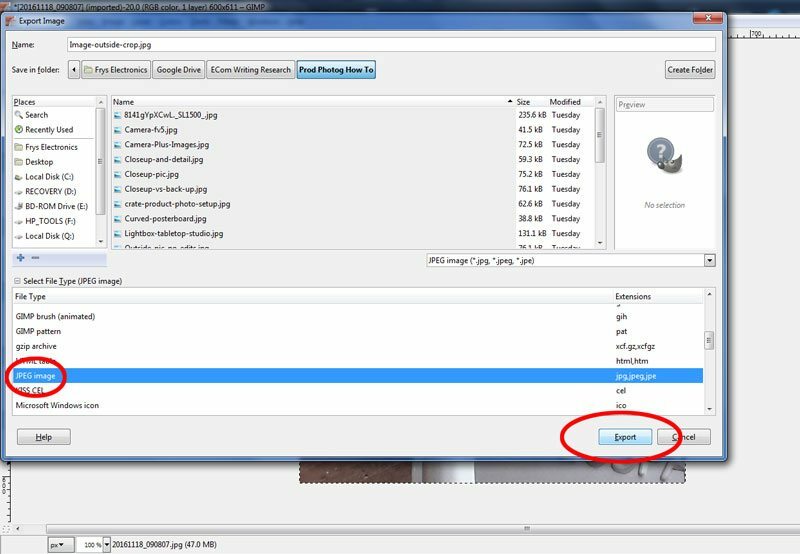 Here’s a look at how to select the .jpg file when exporting an image in Gimp. Note — exporting is Gimp’s way of saving a .jpg. Some apps and programs save a .jpg. Whatever they call it, you end up with a nice, website-ready .jpg image. 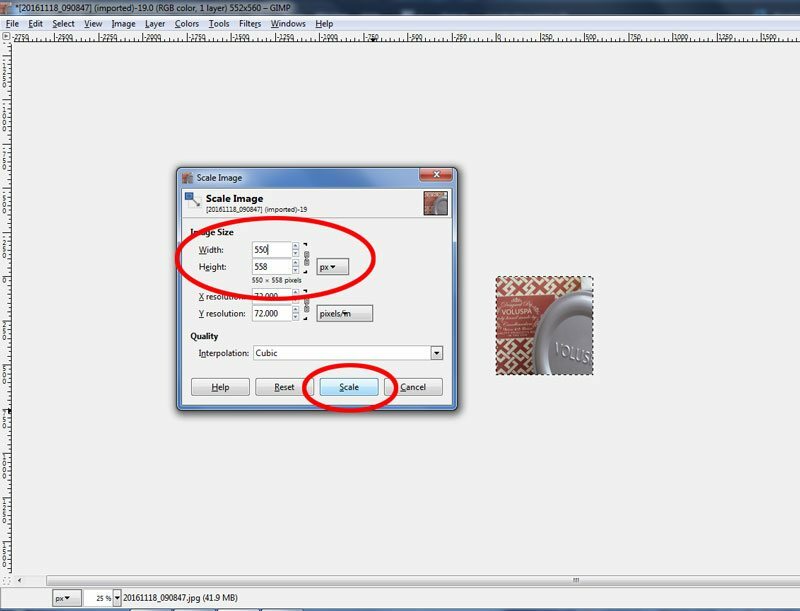 The image below shows how to control the quality of your .jpg image in Gimp. You can adjust the image quality on the slider bar at the top. I typically use a 60-70 quality setting. As you change the quality, you’ll also see the file size change. File size is located just below the quality slider, and is measured in kilobytes (KB). As a rule of thumb, I try to keep product photos under 80kb for fast-loading product pages. 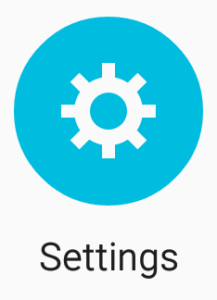 Other settings are available when saving .jpg files. Those circled below, Optimize and Progressive, are the only ones I select to create image files that look good but aren’t too big. The final step is to hit the Save or Export button — depending on your program. Want to learn more? See Gimp’s full Crop & Save tutorial here. Photo Editing Tip for Shopify Stores: If you sell on Facebook, Twitter, and Pinterest using Shopify, we have some great tips to make your Shopify product images look great on all three. Brightness – This control lets you brighten, or darken, the overall shot. Contrast – This control adjusts relative light and dark areas and can help make details stand out. White Balance / Color Cast – This can adjust the overall tint of the image to remove the greenish or red/orange hue from pictures taken with indoor lights. Color Variations or Curves – This gives you more specific controls over image color than white balance/color cast. Last but not least in your product photography plan is just that — have a plan! If you’re shooting many products, you might need one background and lighting scheme for some, and an entirely different scheme for others. A shot list can help you stay organized as you shoot your product pictures. Plus it prevents having to backtrack because you forgot something. Here’s an example of how I plan my photo shoots using a spreadsheet, but you can just jot one down on paper, too. On my shoot list, I include: The item being shot, type of shot, setup, angles needed, plus any notes on details to capture. If editing and cropping your ecommerce product pictures seems daunting, Fiverr.com is an online freelancer directory that’s chock-full of skilled photo editing freelancers. These pros can take care of any product photography editing that you don’t want to tackle, and at reasonable costs that are agreed upon up front. The prices start at just $5! Fiverr is a very transparent system so you shouldn’t have any surprises. Plus you can read reviews from other clients before deciding to assign your project to a freelancer. If you decide to go the Fiverr route, be sure to provide your freelancer with accurate final image specifications including image size, file type, and file size. That way you’ll get what you need the first time. 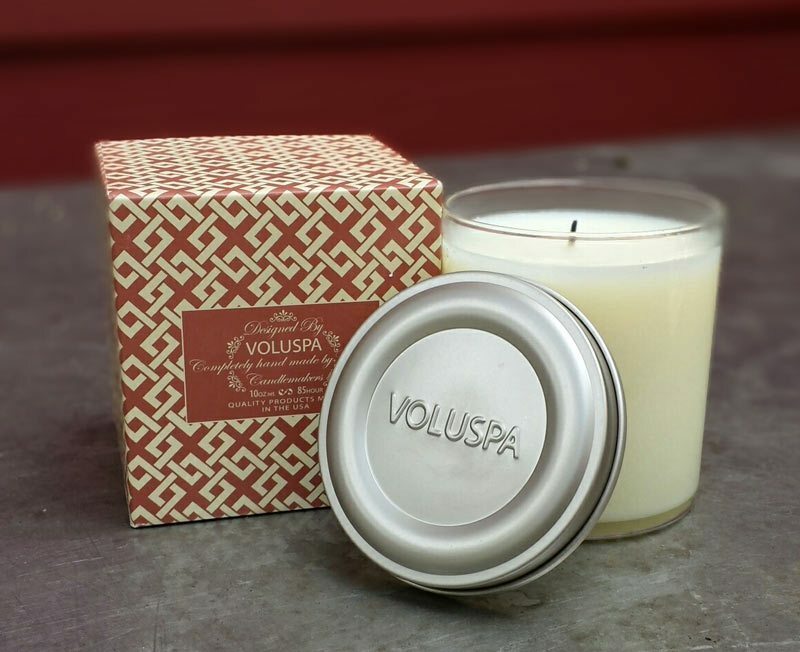 You don’t have to spend a lot of money to create photos that showcase your products online. If you have a relatively new Android or iPhone, access to outdoor light, and a piece of white posterboard, chances are you have what it takes. Great product images are proven to increase sales, so it’s worth taking the time to learn how to capture quality photos. And if you can’t get it all done on your own, the budget-friendly photo editors on Fiverr.com can make your so-so pictures look like they were shot by a pro. Do you have some favorite methods for capturing great product photography for your website or ecommerce store? Please share them in the comments below. Photography with Android, it’s great. But, our phone should have a better camera quality with photo editor app. These apps provide extra features for photos like change color mode, add text, portrait mode etc. And, the size of the image also takes a small memory on our phone. This article is also very helpful for me. Glad it was helpful! I really like the SLR-type apps mentioned in the article. Do you have any tips to take product photos for things that need to hang on a wall? (without putting a bunch of holes into my real wall). I have quite a wall shelves and wall hangings and I’m looking for a way to make a “fake wall” of some sort. In fact I do. We’ve made two types of fake walls for shoots over the years. Option 1: If you stuff isn’t really heavy, check out the wall paneling sheets at home improvement stores. You can get full or half-cut sheets and just lean them upright against a wall. We were doing a barnwood wall look and used the whitewashed style and set it sideways. Worked like a charm. Option 2: For heavier items, you can use a 1/2-in thick plywood sheet and just build a base to hold it on the floor or on your worktable. Depending on what you’re shooting, your “wall” may not need to be big, just large enough to hold what your shooting and a bit of extra surround. You can finish your “wall” in paint, wallpaper, stucco, whatever works for your style, then fill in holes as needed.